Get the monitoring tools you need today, on a platform that’s designed for the future. View data and get clinical intelligence from multiple sources: lab results, medications, MUSE™ cardiology information system data, telemetry and more. Improve patient flow through intra-hospital transport when using CARESCAPE ONE with its built-in display while receiving the seamless data flow with CARESCAPE Gateway into HIS/EMR. Customize the comprehensive set of parameters to integrate seamlessly and enable fast and accurate decision support. Choose options for software, hardware, parameters and other capabilities to keep pace with technology without purchasing all new equipment. Easily train all staff experience levels on the intuitive user interface. OR-dedicated software options to meet your specific monitoring needs. Hardware scalability with parameter modules and a variety of frame and mounting options. Anesthesia Carestation™ solution combines patient monitoring, anesthesia delivery, predictive drug modeling, perioperative imaging and EMR devices in a single, integrated system. Access to ECG database from pre-op to recovery, to assist in the early detection and treatment of potentially lethal cardiac problems. 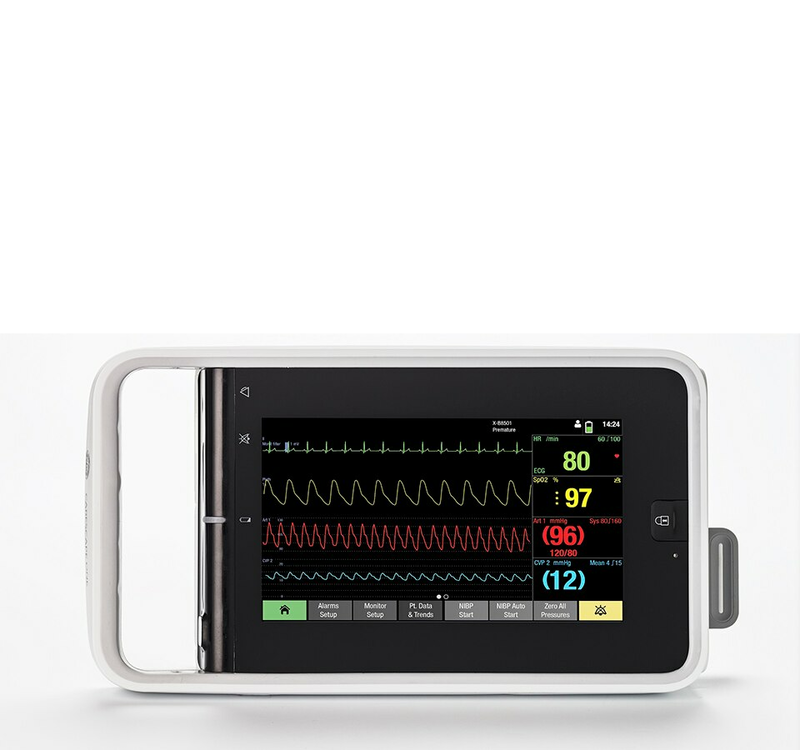 Unity Network™ ID, when combined with the CARESCAPE™ B850 monitor, allows you to connect to other vendors and selected devices, as well as send data to electronic medical records. 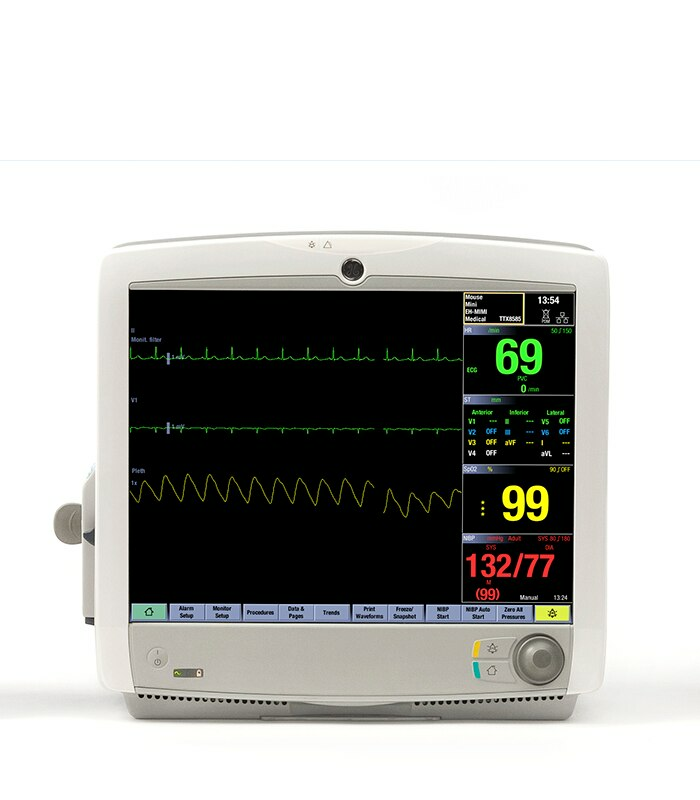 Full OR monitoring, including Spirometry and gas information together with hemodynamic parameters and advanced Adequacy of Anesthesia information (Entropy and NMT measurements). EK-Pro arrhythmia monitoring uses four simultaneous leads for analysis, including atrial fibrillation detection and trending, to help maximize correct event detection and minimize false alarms. Diagnostic quality of 12SL analysis and automatic, initial interpretation, along with two-way integration to the MUSE™ cardiology information system, enable fast, validated access to a patient’s 12SL history and serial comparison of cardiac status. Innovative gas exchange and metabolics technologies, including Patient Spirometry, aid the clinician in optimizing the patient’s nutrition, work of breathing and ventilator settings in order to help the healing and weaning process. Alarm limits are specified for NICU use, and can be silenced easily and routed to a network alarm, for a more peaceful environment. DINAMAP* NIBP algorithm specially tuned for premature physical characteristics. CARESCAPE ONE: Supports bedside and transport clinical workflows across different patient environments and acuity levels by functioning as an independent intra-hospital transport monitor and a multi-parameter acquisition module. 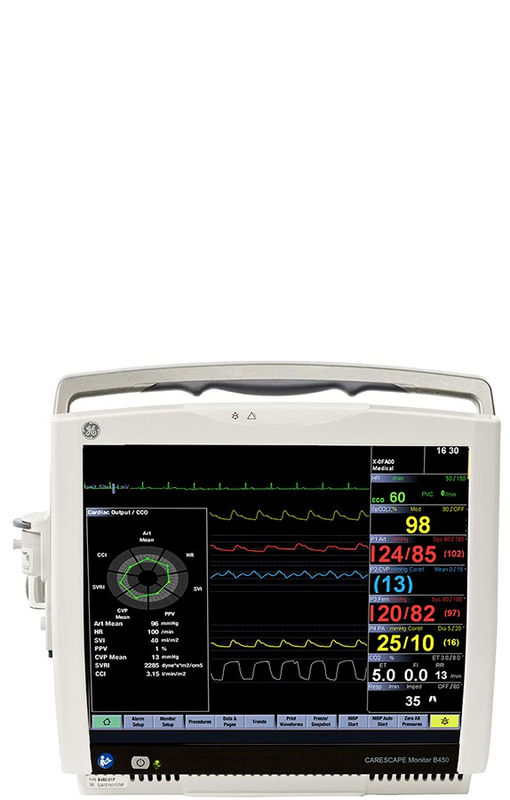 CARESCAPE Patient Data Module: Capable of 24-hour data storage with 36 arrhythmia events, 10 ST segments, 20 cardiac calculations and 10 pulmonary calculations. Exceptional parameter set includes 3-, 5-, and 6-leadwire ECG up to 8 measured ECG waveforms, EK-Pro four-lead arrhythmia analysis, optional 12RL™ derived 12-lead ECG and 12SL diagnostic 12-lead ECG, DINAMAP™ SuperSTAT non-invasive blood pressure, and Masimo® SET® or Nellcor® OxiMax® SpO2.